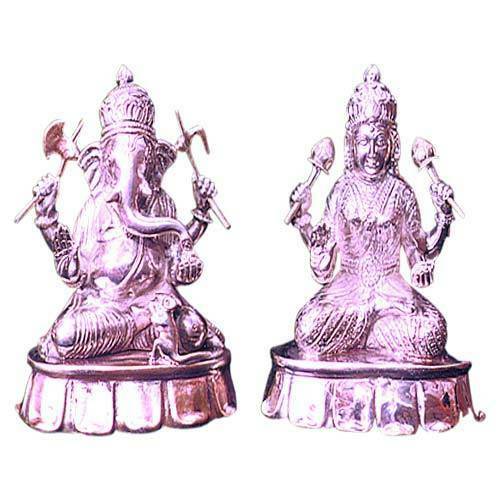 Available with us a wide collection of Silver Plated Idols in varied color combinations. The range of Indian God and Goddess idols is crafted with contemporary designs using superior quality raw material. Further, we also provide value to our clients and also upgrade the standard of excellence. Established in 1991, jai shankar craft is one of the leaders among manufacturers Indian Jewelry. Our product range includes finest quality silver (precious & semi-precious) necklaces, pendants, earrings, crosses, rings, anklets and sets. Ever since inception, we have always tried our best to promote the rich Indian culture by way of art and our fascinating products and artwork have enabled us to represent India in the International arena and also win accolades for our work. Our gallery has an exclusive collection of beautiful quality silver jewelry and gifts and ornaments that are available in variety of colors, designs and shapes. Made of finest quality material, our silver jewelry products have earned us huge accolades from our clients the world across. We design and manufacture our products as per industry standards and the tastes and choices of our most demanding clients. With strong business ethics and customer satisfaction as the prime objective, the company has achieved excellent success in the International Jewelry Export Market. We take every care and attention to offer quality jewelry products at most reasonable prices and delivery within stipulated time frame as demanded by our clients. We are pleased to present ourselves as one of the world leaders in Indian Silver, Semi-Precious and Precious Stones.